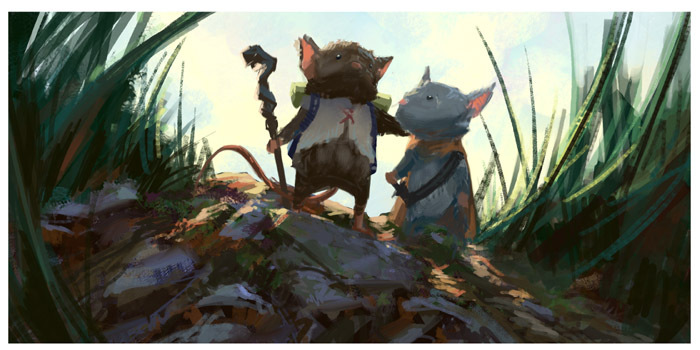 Luke Crane, who designed and wrote the Mouse Guard RPG wrote a new RPG called Torchbearer described by Luke as "Dungeon crawl roleplaying game and love letter to Basic D&D". He asked me to contribute a spot illustration for him for the chapter called "Winter". 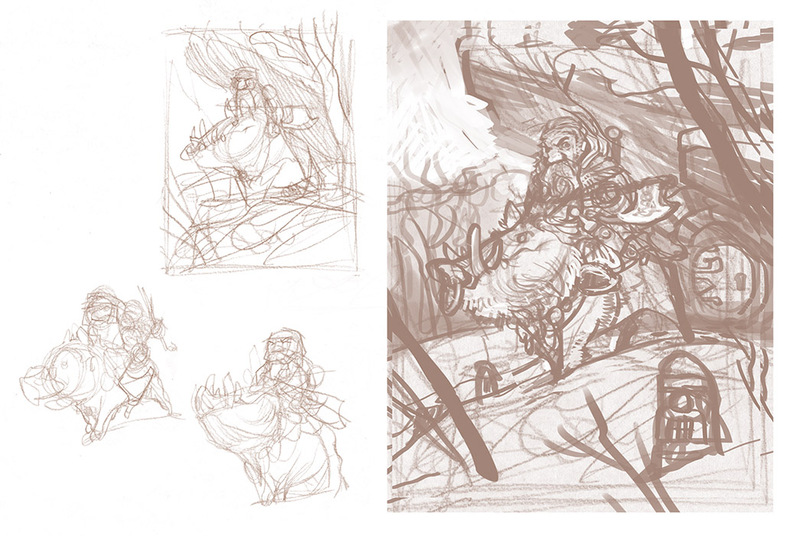 Here is the process for creating that piece for him. The rough started with the description "Exterior of a walled town. Creatures of all sorts lurk in the tree line, leering. A lone wanderer, bundled against the cold, trudges through the snowy waste, casting an ever weakening spell to protect him. The traveler could be Varg, Taika or Ulrik". For the monsters I decided to go with a group of Owlbears. I sketched the owlbears seprately, scanned them and composited them with a reference photo of myself and a stock symbol given to me by Luke as part of Varg's model sheet. Once I had a digital composite mocked up, I printed it out at 5" x 16". I taped that printout to the back of a sheet of Strathmore 300 series Bristol. On the lightbox I was able to see the printout as a guide as I inked. Lastly I scanned the inked artwork and digitally "colored" the piece (all in greyscale for the book's printing specs). To add more depth & effects, I used colorholds on the linework for the snow, castle, and magic spell. David Petersen: Bill, Thank you so much for doing the story and also for doing this interview. 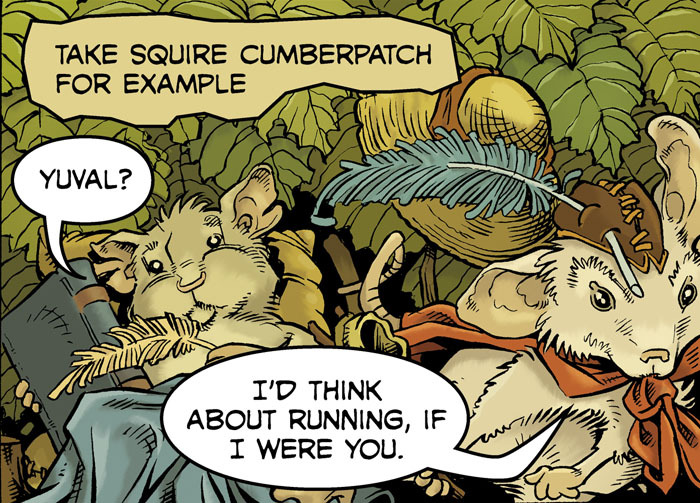 Bill Willingham: You’re welcome. I’m happy to do the interview. I was absolutely tickled to be able to do the story. David: I’ve been touting that this Legends story is your return to drawing comics. What (and when) was the last comic you drew before this Legends of the Guard story? Bill: I think I did a small two-page story for one of the Hero Initiative fundraising books a few years back. 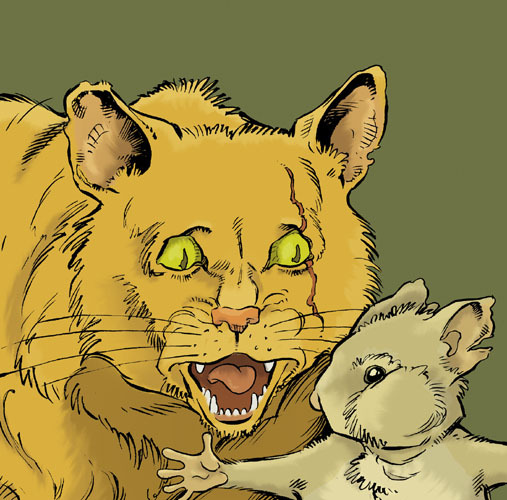 Before that, it was the two issues I did of my own DC series Shadowpact, when I foolishly thought I’d have time to both write and draw the series, without surrendering any of my other work – like Fables, for instance. David: Why had you taken a break from the art side of storytelling? Bill: More of a breakdown than a break. No, wait. That’s too glib and also makes it look like I had a breakdown. Scratch that. I only meant to imply that something in the artist side of me broke at some point. As near as I can piece it together, the pathology went something like this: 1) I started as an artist only. 2) Strong opinions about the overall quality of the scripts I was given, along with a recognition of how much effort goes into producing page after page of art, led me, pretty quickly in the game, to start writing my own stories, under the notion that I can write as well as some and would have the advantage of producing scripts the artist part of me will want to draw. 3) Gradually I wrote more and drew less. 4) Eventually I settled into the realization that I could tell more stories as a writer than as an artist, or by doing both. I never entirely gave up the art side. I’m about to publish a book of what I've been drawing all along, mostly of false-starts on longer works. I suspect I could still draw a monthly book, as long as that is all I do. However, one drawn book a month isn't enough for me. That would preclude too many other story projects. 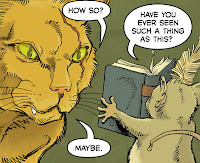 David: Last spring, you brought a group of comic storytellers together (including myself and the Mice Templar folks) for Fabletown and Beyond under the banner of us all being "Mythic Fiction". Can you explain how you see that category of story and why it’s important? Bill: Mythic Fiction is our first heroic storytelling genre. 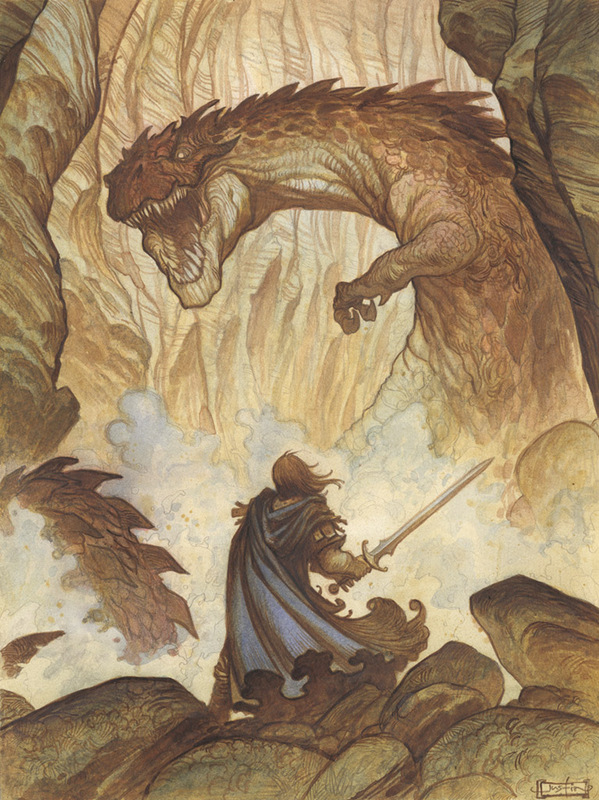 It’s Beowulf and Gilgamesh and The Iliad, and so much more. Superheroes, if anything, are a subset of that genre – one that is currently having a bit of trouble keeping in touch with the wondrous aspect of the form, but I’m confident they’ll find their way again. 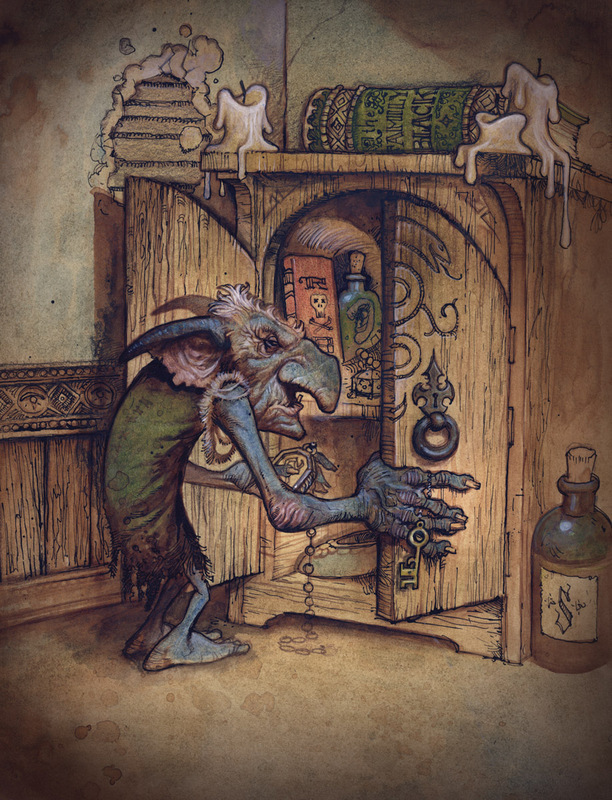 I can’t say for certain why Mythic Fiction is important in the grand scheme, but it’s vital for me, because most of what I want to say lies within its magical boundaries. 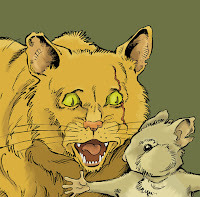 David: For your Legends of the Guard story you have a mouse outwitting a cat to save his own life. Where did the seed of this story come from? Bill: In our current pop fiction, most professional warriors are portrayed as dimwitted thugs, whereas the opposite is true. The best soldiers have always had to be smart. I liked the idea of an old retired campaigner who no longer had his strength and martial skill, but still had his wits about him. David: When you start a story that you are going to both write and draw, do you start with any visuals? or does the writer cap get donned first for an outline or script? Bill: Both. Depends on the story. In this case, I wrote it first and drew it following the script. In other cases it’s a more organic thing, creating art and story as I go. David: From veteran writer/artist Sergio Aragonés to me when I was starting out on a writer/artist path: Never allow the artist side of you to bully the writer side of you into writing something easy to draw. And never let the writer in you bully the artist to draw something that doesn’t work visually. Do you ever wrestle with the two roles when writing and drawing the same project? Or do you work in harmony with yourself? Bill: I constantly wrestle with the two halves of the Jekyll and Hide artist/writer relationship. And I think that’s the only way to do it. If both sides are in harmony, I would immediately think that both sides are taking it easy. David: For the artwork how do you start? 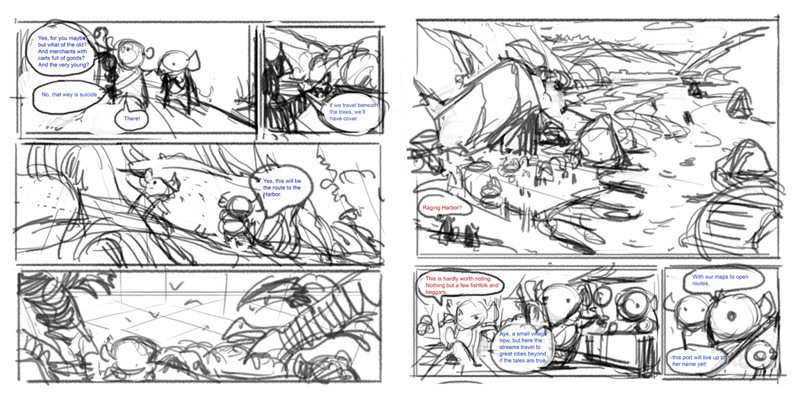 With thumbnails or straight to the final paper surface? Bill: Straight to the final page. Any joy I find in my own art comes from the spontaneity of the drawing. 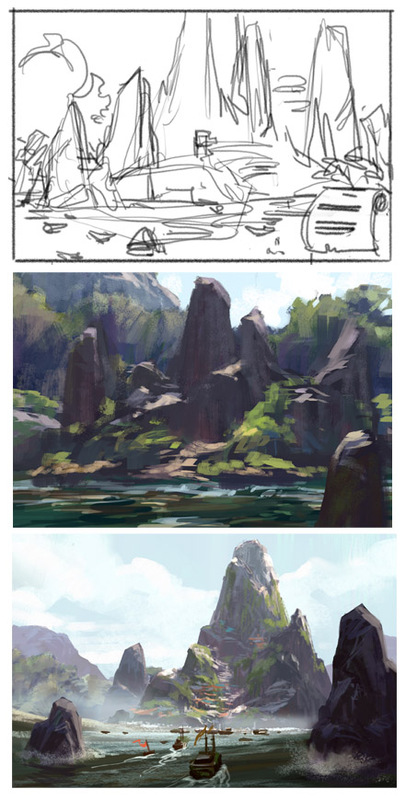 Start with thumbnails or layouts, or what-have-you, and that spontaneity gets leached out along the way. If I have the script and am doing my own lettering, I also letter each panel first, before a single line is placed on the page, to establish the real space I have in which to draw. David: What are your preferred tools for drawing and inking? Bill: I use a standard lead holder with a # 2 lead (although that can change, depending on the surface of the paper). Then I ink with Black Magic ink applied with a Windsor Newton # 2 brush. Can’t ink with a pen to save my life. David: What artists influenced your work as you developed as both an artist and writer? Do you still look to certain artists for visual inspiration today? or certain writers for inspiration? Bill: All of them. Anyone who caught my eye. The greatest influences art-wise today can be found in the classic age of magazine illustration (now sadly passed). Writers are the same. Anyone and everyone who writes well inspires me. David: Bill, Thank you again for the story. Where can people find out more about you and your work? 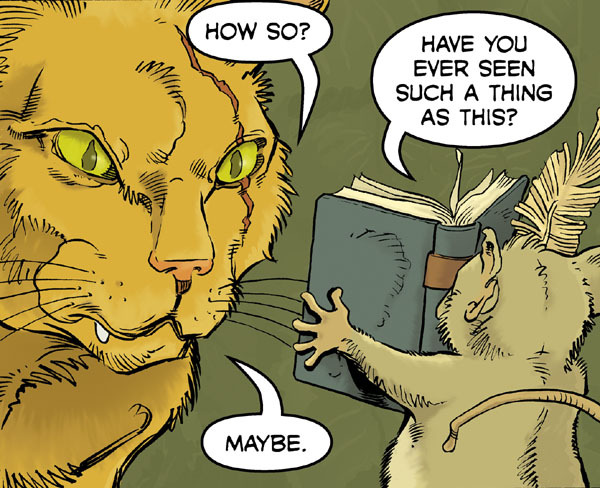 Bill: You can find my main project, Fables, at any comic shop. We've been doing it for eleven years now and about 140 issues. By the time this is posted, Telltale Games will have also released the first of its many video games based upon Fables, called The Wolf Among Us. We keep the Fables books in print, in about 20 collections, and most shops are good at keeping those in stock. To find out more about me, I sort of have a website that I sort of keep up to date. I think it’s at BillWillingham.com. 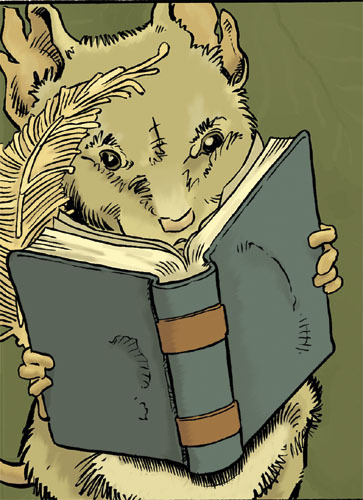 I also tweet via @BillWillingham. As a note to the readers, Justin’s story is a little different from the others. The story takes the form of a song with musical notation. Each page is a verse and has a 1/3 page illustration of the verse by Justin. Because I don’t want to spoil much of the story, this interview will focus more on Justin and his work and process than the Legends story itself. David Petersen: Justin, Thanks for doing the story on short notice! And I appreciate you doing the interview too. I was very glad to get you on-board for this project. When I’d asked you before the song framework was an option, you’d been worried about doing sequential storytelling. 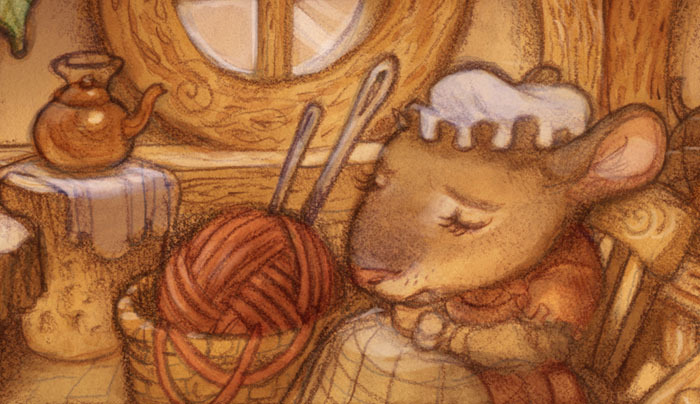 Do you have the desire to tell stories longer than a few illustrations allow? either with comics or prose? When I look at your sketchbooks I always feel like there is a bigger story you are itching to tell. 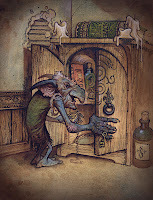 Justin Gerard Oh definitely. Most of them start out as just little doodles without much meaning or context. Just a character that seems interesting. But then you kind of can't help but start designing a world around them that seems appropriate to them. And once you've done that it's hard not to start populating it and exploring it. And then the story part sort of develop naturally whether you mean for it to or not. So most of these worlds end up with stories that I definitely wish I could cobble into some kind of larger and more cohesive whole. Sadly, I am not the most gifted writer, and when I try to mesh the writing with the images, it doesn't always work as well as I'd like. David: Talk about your background in art. Were you one of those kids that was drawing before you were walking? Did you have family support to continue in art? What was your pre-college art education like? Justin: Haha, yes I probably was one of those kids who was drawing before he was walking. My memory is terrible, so I can't say that for sure, but it seems like it. My mother claims that she drew pictures in my peanut butter sandwiches and then takes all the credit for my stuff. (Which probably answers the second question) My parents were definitely very supportive and I owe them a great deal for everything. I went to Bob Jones University for art. My college art experience wasn't much to speak about. Most of what I gained from college was probably taste, rather than technical ability. Bob Jones has a really incredible collection of religious art, in particular a gallery with quite a few enormous Benjamin West paintings in them. I stole a step by step guide from the library while I was there. 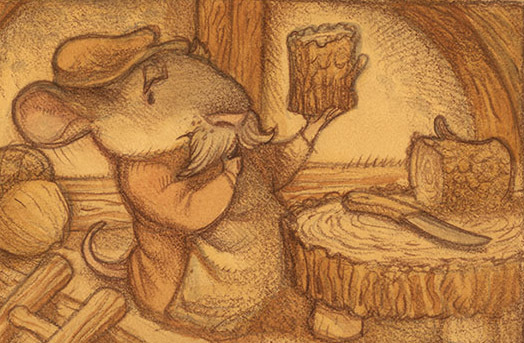 It was the one with the Peter DeSeve tutorial in it. (The one with the pirates.) I studied it voraciously and never returned it. To this day it has probably had more impact on how I work than anything else I ever came across. However, probably the best education I got, I got at the universities book press, where I worked while I was in college. It was awesome experience and did tons to prepare me for the professional world and freelance illustration. I am really thankful for the opportunity to work there during college. David: You now teach art and illustration through a few venues including the Lamp Post Guild. Was there something from your education you felt really needed to be passed on or a case of you wanting to help new students fill in all the gaps your formal training lacked? 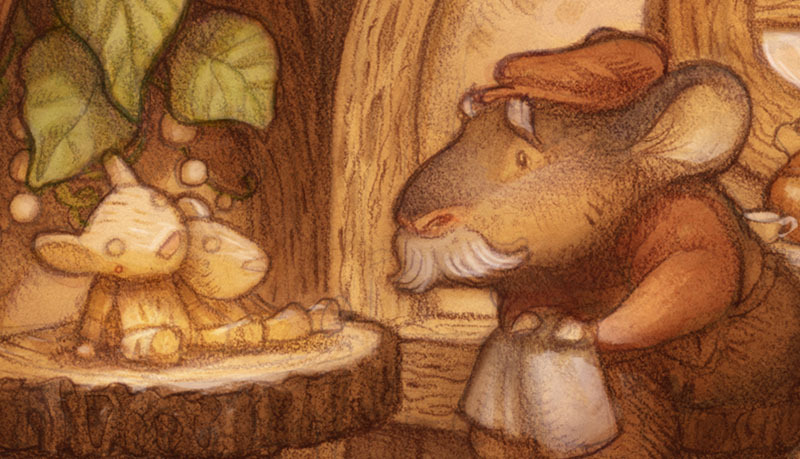 What is the best piece of illustration advice you have even been given or could give? Justin: Hmmmm… Actually, what it is I think, is that I want to teach at a school someday; But not yet. For now I would just like to do smaller presentations, and classes and demos where I can. Right now I still have all these ideas and things I want to try. Clients I want to work for, projects I want to do and shows I want to have. I would like to gain a bit more experience in the commercial art world before feeling like I would be ready to teach full-time. That way, when I go to teach, I will have the benefit of actual market experience, and won't just be theorizing about the way I think the market ought to be. As far as advice goes, I would say, only do this if you really love just sitting alone and drawing. And if you do find that you love that, then just do it a lot. Just draw a ton, and draw the things you love. 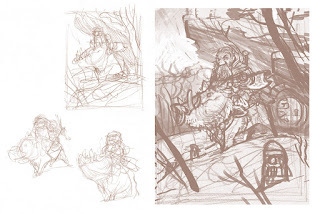 David: By looking at your blog, it’s clear you do a great deal of process work before the final image including character studies, layouts, color composites, and preliminary paintings. How do you keep from going too far in an image’s development so you don’t feel it’s overworked or that you've overstayed your creative welcome in that image...all while still doing the right amount of preparation? out, but you will definitely raise the overall quality of your work. David: My readers enjoy hearing about tools of the trade, please share what you like to draw with, paper surfaces, color methods, etc. Justin: I tend to switch things up a lot when I work. It is rarely the same method twice. I will work in pencil or oil or acrylic or watercolor depending on what I am wanting to do with the piece. 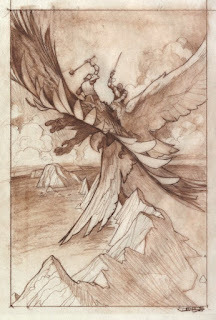 But perhaps the method I end up going back to the most is colored pencils and watercolor on Strathmore 500 series vellum bristol which I then work digitally over top of. David: Who would you cite as creative influences? Justin: The list is enormous and it would be impossible to mention all of them. DeSeve is a great one obviously, Gustafson, Bonner and Meseldzija are perhaps some of the most influential for me as far as contemporaries go. Rackham, Rembrandt, Leighton, Friedrich and Dore for the classics. But really the list is enormous, I am always interested in discovering new talent and stumbling on classics I never knew of. Last week I stumbled on a French Academic painter named Vibert Jehan Georges whose oil paintings are just amazing, and everyone should check out his work. It's just fantastic. David: What projects are coming up next that folks should look out for? David: I'm really looking forward to that project! Justin, thanks again for doing the story and interview. Where can people find out more about you and your work? David Petersen: You are not normally a comic-guy, tell the readers about your work and background. Jackson Sze: Thanks for chatting with me, and also, thank you so much for allowing me to spend some time in the world of MouseGuard. I am truly grateful for the opportunity! I am a Concept Artist based in Los Angeles. Right now I’m working in movies, but I’ve been fortunate enough to work in other areas such as videogames, television, advertising… and now, a little bit of Comics! Environment Design is what I concentrated on in school, but lately I’ve been trying to do more storytelling with my illustrations. 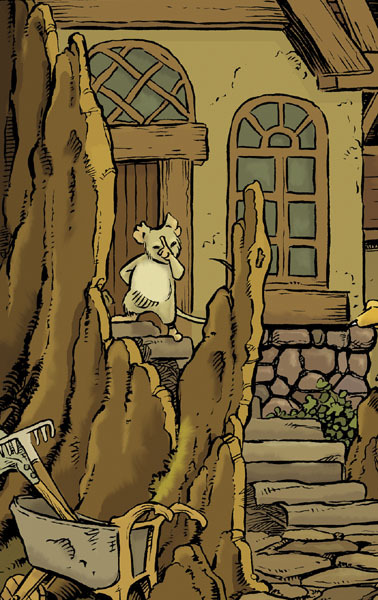 Working on MouseGuard has been a great way for me to explore visual storytelling. David: I am very pleased that Legends of the Guard is your comic debut! Had you wanted to do comics before? or did I just twist your arm enough? Jackson: Comics has always seem an intimidating medium for me. I don’t have comic experience, and to be responsible for everything at once was a terrific challenge. Thanks to the support both you and Paul gave me, I think I managed to tell a coherent short story. Thanks for asking me to do it. I am so glad I did. David: I really admire your paintings of settings and locations. So, while I try and stay as hands-off as possible with these Legends stories, I did encourage you to do a story based on the theme of visiting several locations. Tell the readers about the process you went through to shape that push of mine into a narrative and give us a tease of what it’s about. Jackson: Thanks for the suggestions! 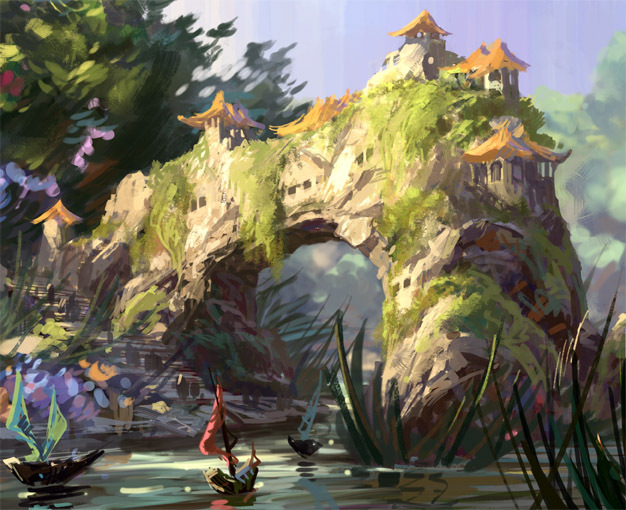 Environment design is what I am most comfortable with, so that is a great starting point for me to think about the story. In order to showcase the locations, we needed a tour guide of sorts to bring the readers along. Things will hopefully feel fresher if our characters are experiencing these areas for the first time as well. 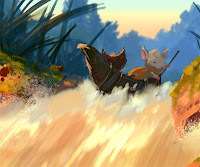 A cartographer mouse seems an ideal character to be our guide on this journey. 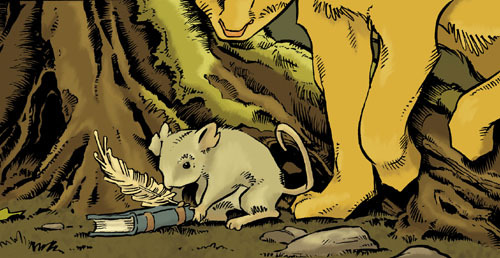 With this short story, our characters will travel to foreign lands beyond the known mouse territories. 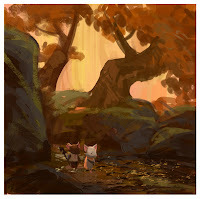 Hopefully there will be some character growth as well as actual journeying accomplished by the end. 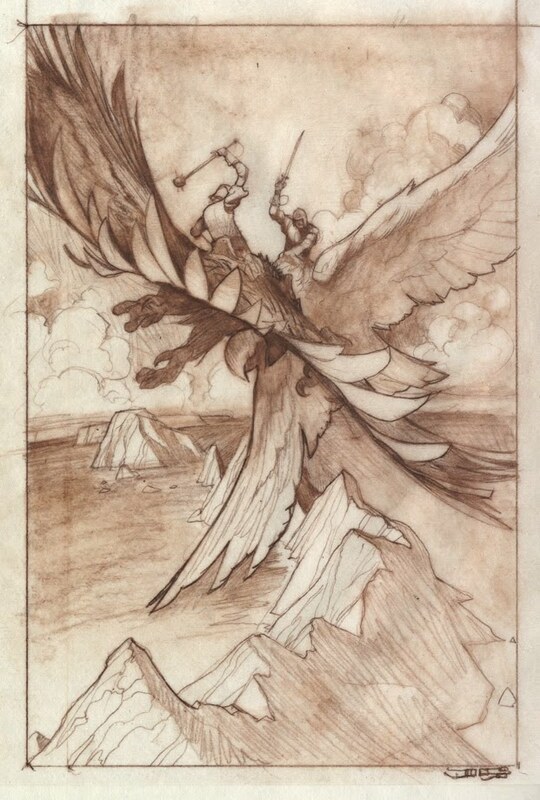 David: Since you normally are doing single images or a series of images meant to shape the viewers’ understanding of an environment’s atmosphere and design, did you find telling a story in pictures a great departure? or did it come naturally? Jackson: I had to find a balance between character driven storytelling, and showcasing the locations. In the end I treated the comic like an animated film, imagining the shots I’d like to see, while working in the panel structure of comics. David: What artists inspire you and your work? Jackson: Hayao Miyazaki’s Laputa is why I am an artist today. His movies inspired me greatly as a child. Otherwise, impressionist painters, California Impressionism and the many excellent contemporary digital painters continue to inspire my love of painting. David: How about telling readers the process of making your artwork. It’s all digital, but walk us through your process and tell us about your set-up. Jackson: My process is pretty typical, and yes this comic was done digitally. After writing the script, I’d imagine the shots I’d like to see and loosely lay them out on the page. These will be rough sketches. Often I’ll have to adjust what I had in mind to what is actually working on the page. Mostly I hope to communicate clearly what is happening in each shot, while maintaining some sense of continuity. A change in the camera’s perspective here and there helps add contrast to the visuals. 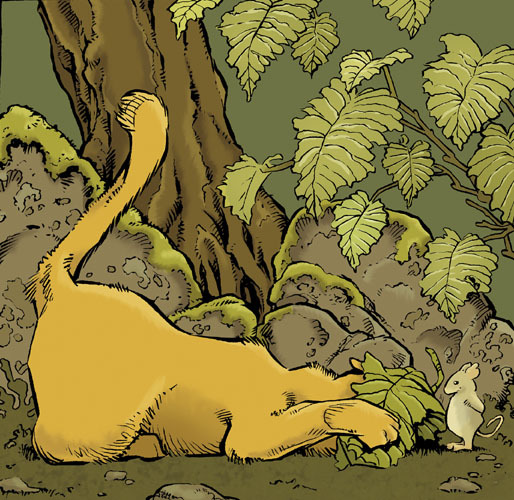 The panels were often regarded as a series rather than a single image. What came before, what’s interesting after… that kind of thing. 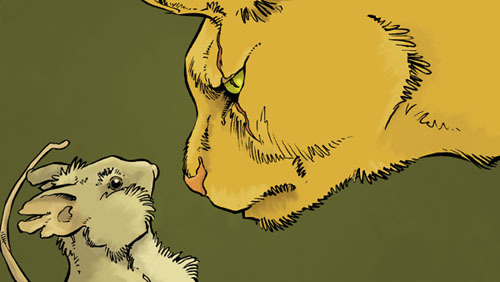 After the lay in, I’d do a color pass on the entire comic, adjust and refine till it’s done! Setup wise I have a dual monitor setup with a PC. I went back to using a Wacom tablet after a few years of using the Cintiq… it’s all about screen real estate! David: Lighting & atmosphere is very strong in your work. How early in image making are you thinking about the color palette and it’s lighting? Do you have a clear image in your mind before you start painting? or does it develop through early sketching and blocking in shapes? Jackson: I knew I wanted a color scheme that makes sense throughout the story. So as I do the first color pass, I’m thinking about the mood I want to achieve, time of day, weather conditions, seasons, things like that. The rough pass acts as a mini color script and I adjust for continuity and variety. The plan was to start with an overcast morning, vary the colors of their journey, and end with a sunset. David: Thanks Jackson. Where can readers find out more about you and your work? 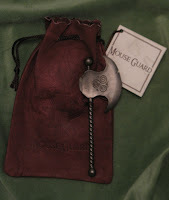 Israel Skelton of Skelton Crew Studios released a mouse-scale replica the Black Axe last year...but that piece was only the beginning of a larger line or replica products for the Mouse Guard fans...In this post, I wanted to share a bit of what Israel and I have planned for the future of this line and for your mouse-sized armory. Two weeks ago saw the release of Rand's shield. I first drew a piece of control art with measurements for Israel. 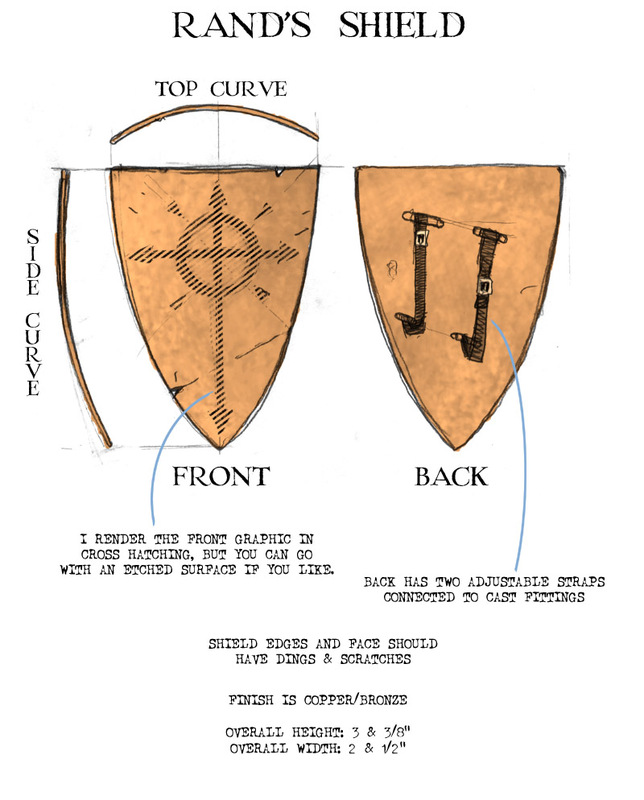 When I draw this artwork, I have to look at all of the times I've drawn that piece in the Mouse Guard books and come up with an amalgamation of it ignoring inconsistencies and making an idealized version of the weapon or, in this case, armor. I try and give Israel different views and suggestions of how I see details working for the replica. Israel then makes a prototype. 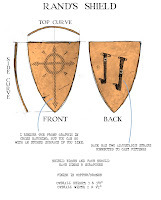 For Rand's Shield, we discussed what to do about the back where the straps would go. I suggested they could be cast metal that was painted, or they could be left off...as though they have rotted away. But Israel insisted that if they are supposed to be leather straps, he would make sure the replicas all had leather straps. This photo is one he sent me to show an example of the strap material against the prototype. 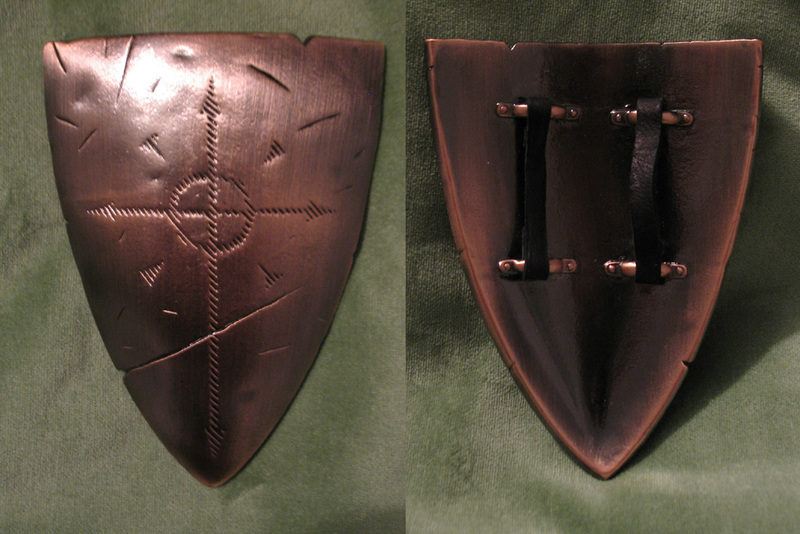 The final product is a pewter casting that has been plated and antiqued to look like the shield from the comic (or even better in my opinion). 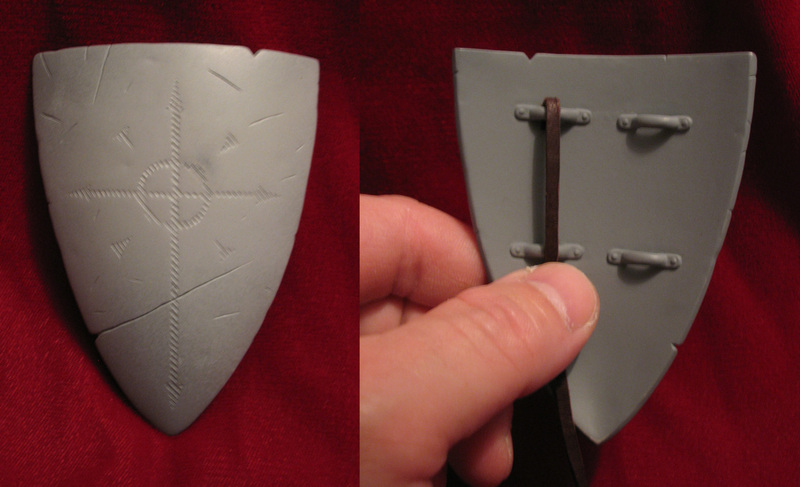 This photo shows a near final version of the shield, Israel had some finish tweaks he wanted to do before they went into production. And these are available through the Skelton Crew store currently. The next scheduled item is actually a pair of items. 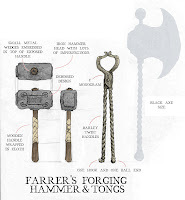 The hammer and tongs of Farrer, the mouse who forged the mythic Black Axe. 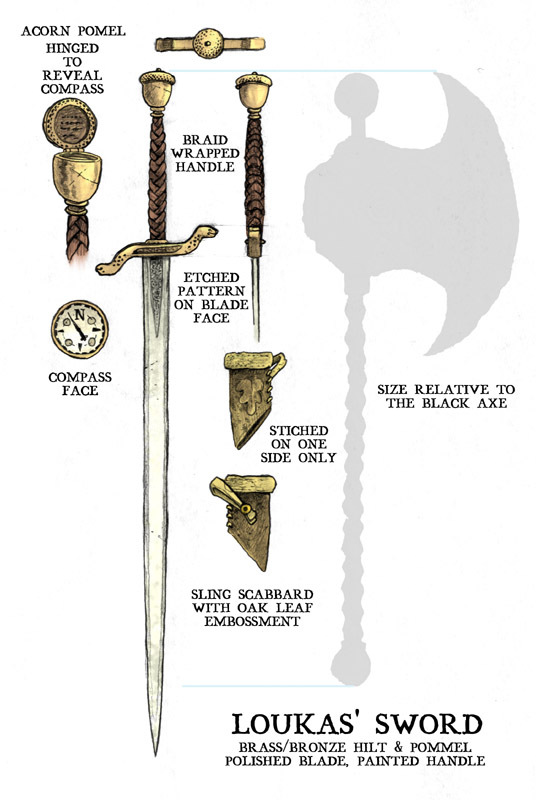 For the control art I included a scale reference to the Black Axe, something Israel appreciated and requested I do in all the new pieces. 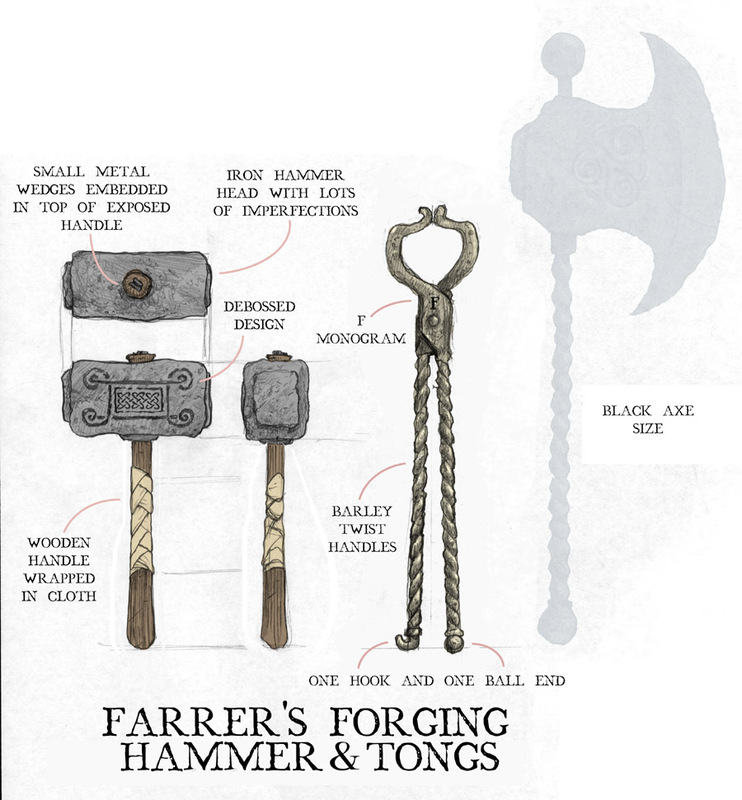 I talked Israel out of having each hammer's handle be made of real wood...however, the tongs will pivot and function as real tongs would. The design of this sword started with a drawing Jeremy Bastian did for my 30th Birthday of a mouse wielding a sword like this one. I liked the drawing and sword so much, I told him I was stealing it. In the Mouse Guard comics it became Saxon's mentor Loukas' sword...which Saxon later inherits. Israel has informed me that while the hinge won't match mine, and there will be no working compass inside, the acorn-cap pommel will indeed open in the replica...even though it will be no bigger around than a pencil eraser. 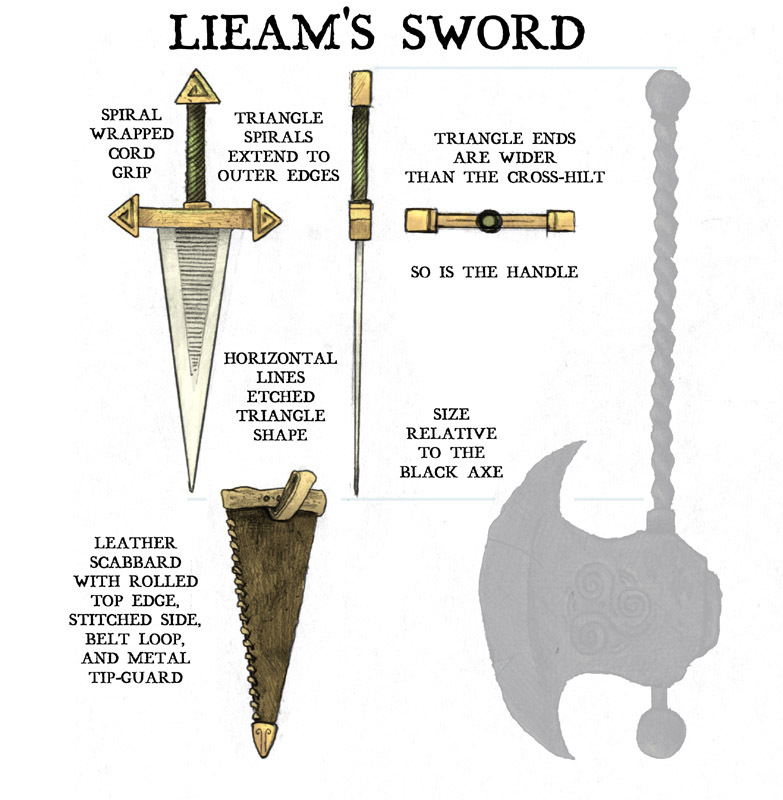 That strange triangle sword I drew for Lieam has become an iconic weapon for the character (even though he only had it in issues #1 & half of #3 in Fall...) Because my drawings had changed so much between when I drew Fall 1152 and now (as well as the times I've drawn Lieam with this sword for spot illos and commissions) I had to really adjust the proportions and design of the sword into this version. 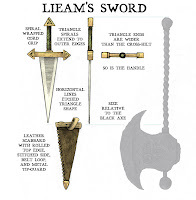 Because the next volume of Mouse Guard will take place in 1149, Lieam will again have this sword...which will make the replica a welcome addition to my reference shelf. Israel requested this one come sooner than later. 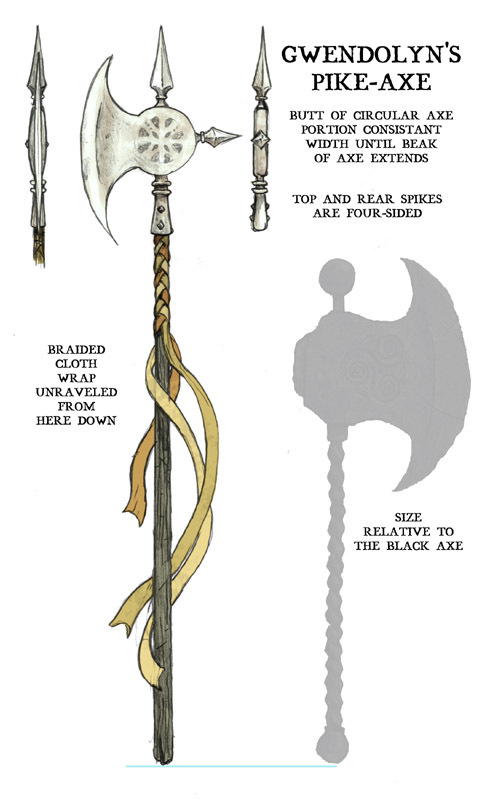 I designed the weapon for Gwendolyn as something of a cross between functional and ceremonial. 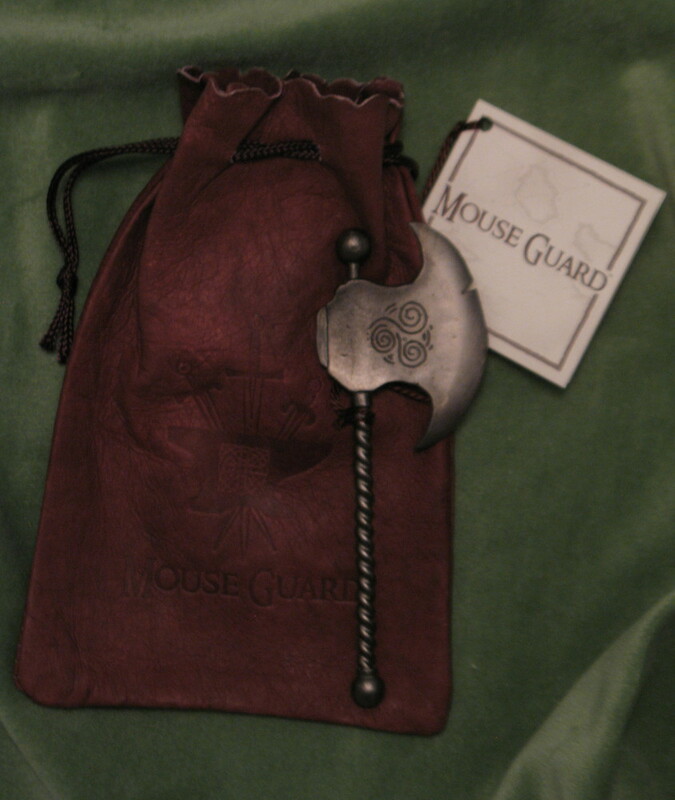 I wanted it to be something she could 'knight' mice into the Guard with and keep enemies at a distance with. In talking with Israel, I mentioned that I knew the braided cloth would be a pain for this replica so he could scrap them if he wanted...but not Israel. He said they will all have the braided cloth for certain when it comes time to make this replica. It's wonderful as a creator to entrust your world and designs to a skilled and talented craftsman like Israel Skelton. I hope you fans agree.